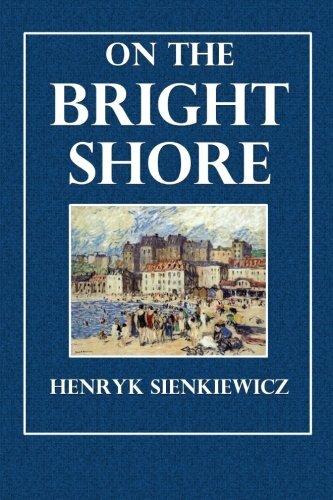 Amazon.com description: Product Description: "On the Bright Shore" By Henryk Sienkiewicz, author of "Quo Vadis." Authorized unabridged translation from the Polish by Jeremiah Curtin. The story of a Polish artist in the Riviera, in contact with the woman he at last wins, told with vivid detail but simple in the general effect. An excerpt from the beginning of the CHAPTER I. THE artist was sitting beside Pani Elzen in an open carriage; on the front seat were her sons, the twin brothers, Romulus and Remus. He was partly conversing with the lady, partly thinking of a question which required prompt decision, and partly looking at the sea. There was something to look at. They were driving from Nice toward Monte Carlo by the so-called Old Cornice; that is, by a road along impending cliffs, high above the water. On the left, the view was hidden by naked towering rocks, which were gray, with a rosy pearl tinge; on the right was the blue Mediterranean, which appeared to lie immensely low down, thus producing the effect of an abyss and of boundlessness. From the height on which they were moving, the small fishing-boats seemed like white spots, so that frequently it was difficult to distinguish a distant sail from a seamew circling above the water. Pani Elzen had placed her hand on Svirski's arm; her face was that of a woman delighted and forgetful of what she is doing; she gazed with dreamy eyes over the mirror of the sea. Svirski felt the touch; a quiver of delight ran through him, and he thought that if at that moment Romulus and Remus had not been in front of them, he might have placed his arm around the young woman, perhaps, and pressed her to his bosom. But straightway a certain fear seized him at the thought that hesitation would then have an end, and the question be settled. "Stop the carriage, please," said Pani Elzen. Svirski stopped the carriage, and they were silent a moment. "How quiet it is here after the bustle of Monte Carlo!" said the young widow. "I hear only music," answered the artist; "perhaps the bands are playing on the ironclads in Villa Franca."